Answer friends alone in kind. The poem goes on, but this first part is a straight-forward tribute to my favorite animal. "Just your foot upon my hand/Softly bids it understand." Ah, lovely. You can read the complete poem here. The Poetry Friday Round-Up is at Write Read Believe. Check out this week's entries and then go back to last week for Sara's analysis of a Wallace Stevens poem. She said, "Should we always post poems we love on Poetry Friday? Or go a little mad and share something confounding every once in a while? You know my answer." I do, and I concur, but as a whole, most children's writers are too gosh-darn nice to ruffle anyone's feathers! So lovely! Cats are lovely. Sara, I'm allergic, too, but I'm owned by two cats and wouldn't think of not having these lovely companions! It was difficult to breathe for a while, but everything seems to be under control now. I wouldn't, though, suggest following in my footsteps! 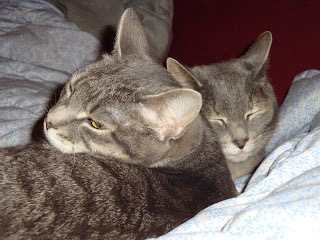 The photo shows Skippy (front) and Smudge. Skippy will turn 1 sometime this month. She is a horse, quite clumsy, and is currently acting like a teen. Smudge is about 15, weighs about 4 1/2 pounds, and is as graceful as an angel. Probably more information than anyone wanted to know!